Custom dentures can restore a beautiful smile in both form and function so you can feel confident again. Northwest Dental’s team of licensed denturists and dentists are skilled in the art of fitting and making dentures. With locations in Bellingham, Burlington, Arlington, Everett, and Oak Harbor, Washington, the knowledgeable team is ready to help you look and feel your best again with a denture option that’s right for your lifestyle. Call or schedule a consultation online today. The licensed denturists at Northwest Dental construct all of their dentures on location in their dental labs. This is a great advantage, as you are able to see your dentures throughout the process. Your denturist can make adjustments and changes along the way to ensure the ideal fit and most aesthetically pleasing finished product. If you’ve lost your teeth as a result of illness, decay, or injury, and need full dentures, you may be a good candidate for immediate dentures. Immediate dentures offer you the benefit and convenience of never having to be without teeth. Be aware, though, that as your mouth heals from the loss of your natural teeth and immediate denture inserts, your dentures require relining to ensure the most comfortable and accurate fit over time. 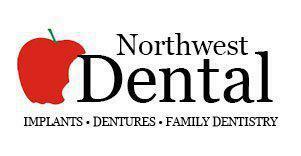 Northwest Dental offices offer free consultations to determine if immediate dentures are right for your dental needs. If you are a good candidate, the dentist or denturist takes measurements of your jaw and makes models of your mouth so they can construct your new dentures in their lab as efficiently as possible. Partial dentures with a metal framework are the most common type of partials. They only replace missing teeth, rather than all of your natural teeth like full dentures. The metal framework provides strong support and helps with chewing when you are missing back teeth. Partial dentures with metal frames securely anchor to your existing teeth and stay in place without the use of dental adhesives. Acrylic partial dentures are less expensive than metal ones but don’t last as long. They are typically used to replace front teeth as a temporary solution while the dentist constructs permanent partials or bridges. The licensed denturists at Northwest Dental offer a wide range of denture repairs in just a couple hours, or even while you wait. They repair your custom dentures or an existing set of dentures on-site. Call one of the convenient locations or schedule a denture consultation online.